Hartpury are pleased to announce that five young players from our good friends at the Bristol Bears have been made available to Hartpury RFC, on loan, with immediate effect. 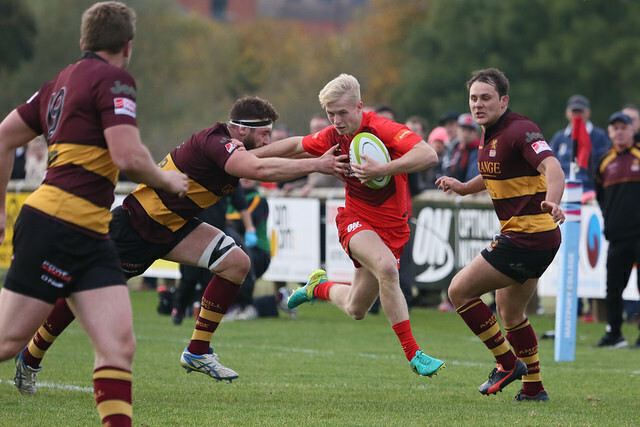 The name best known to supporters of the Red & Blacks will be that of pacy wing/full-back/fly-half Mat Protheroe (pictured), who starred in two AASE Championship triumphs with Hartpury before joining Gloucester Rugby, en-route to Ashton Gate. Protheroe’s most recent Hartpury performances were in the ‘100%’ National One campaign of 2016-17, when he regularly combined with the likes of Harry Randall (now Bristol), Jake Polledri (Gloucester & Italy), Ben Vellacott (Gloucester) and Lithuanian express, Jonas Mikalcius, to terrorise opposition defences. Joining him on loan will be Ehize Ehizode, who has been performing well for Hartpury in recent weeks, as well as Sam Graham and Charlie Powell, who both had some limited involvement earlier in the season. Powell’s single appearance was in the 23-17 win over this Saturday’s opponents, Coventry, back in September. The fifth member of the quintet – and the only one with no prior Hartpury involvement – is prop forward, Jake Armstrong, signed by Bristol from the Jersey Reds prior to the current season, and previously of both Doncaster Knights and Wharfedale. We welcome them all to the Gillman’s Ground. All are immediately available for selection.